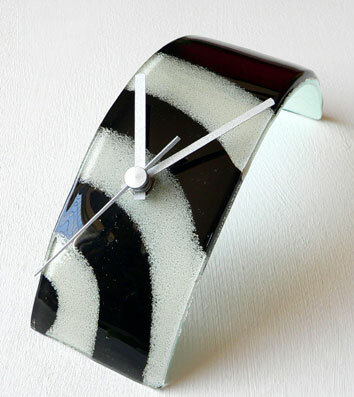 Stunning handmade fusion glass table clock. Set in an eye catching black and white swirls design, with silver hands. Contemporary curved design allowing you to set on a table. Width is 7cm and length is 28cm. This clock is handmade and to a high design quality, sure to draw comments from everyone who sees it!